Atlanta Sai Center has many ongoing service projects. These projects scheduled on a weekly, bi-weekly or monthly basis and most of the service projects are conveniently scheduled on Saturdays. The Center also undertakes some special service projects to coincide with the special events or occasions. Some seasonal service projects are also taken up to help the community we live in. Here is the current list of all the service activities that are going on. If you would like to join our team of highly motivated and committed service volunteers, please get in touch with the Service Coordinator at the Center during our Sunday service or you can also reach the coordinator by sending an email to atlsai.service@gmail.com. We also send out weekly email updates on service activities along with detailed schedules. Narayana seva is a project that begins by meeting every Saturday at 9.30 AM at a Center member’s home. We pack approximately 120-150 grocery bags, each with about nine different items while chanting the all powerful Gayathri Mantra. After packing of these bags, we sing Bhajans for about 20 minutes. After Bhajans, we head down to Atlanta Mission Men’s Shelter where we distribute about 100 bags. The rest of the bags are distributed to the needy on street side. 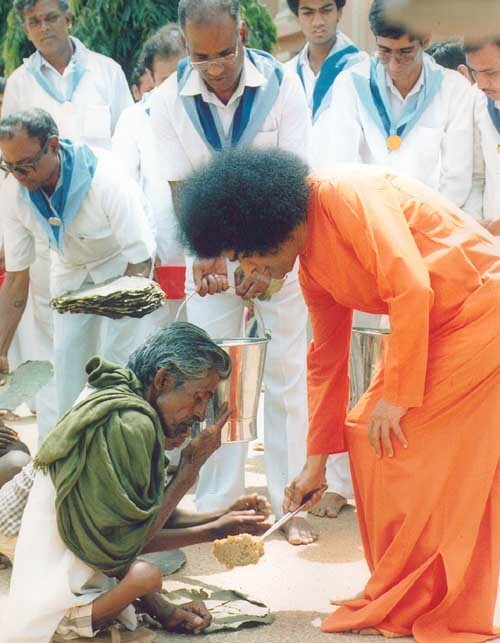 Atlanta Sai Center has been performing this service activity continuously for more than two decades. Meals on Wheels (MoW) is an organization that provides prepared and pre-packaged meals to registered seniors of Atlanta. Every week we undertake distribution of these food packets at designated addresses on two routes. Each route will require at least two volunteers (can be family members). After picking the food packets from the offices of Meals on Wheels, volunteers go on their designated routes. This service usually takes about two to three hours. We normally have at least four volunteers for this service every week. Budd Terrace Nursing Home near Wesley Woods is a skilled nursing center located in Atlanta, where generations of seniors have been provided expert senior care and assistance. The type of care includes a few weeks of post-acute care, or long-term care needs of patients. Once a month we meet at this nursing home. We undertake recreational activities in the form of singing folks songs, serve cookies & ice cream, and make the seniors cheerful during this time. We usually need 6 to 10 volunteers for this service activity. Atlanta Mission Women’s Shelter houses women and children. Once a month, we prepare breakfast for 150 – 200 residents including adults and children. We prepare food as per the menu set in consultation with the management team of the shelter. We typically need 10-15 volunteers for this service. Atlanta Mission Men’s Shelter houses men and provides them with food, accommodation, skills based training etc. Once a month, we prepare breakfast for 200 – 250 residents. We prepare food as per the menu set in consultation with the management team of the shelter. We typically need 15 – 20 volunteers for this service activity. Must Ministries helps the needy in the neighborhood of Marietta, Smyrna and Canton cities (located in Cobb and Cherokee counties). Once a month, at the Marietta location, we prepare breakfast for 55 – 70 residents consisting men and women. We prepare food as per the menu set in consultation with the management team of the shelter. We typically need about 8 – 10 volunteers for this service activity. Our House & the Genesis Shelter provides childcare and support for homeless families. We cook and serve dinner for about 40 visitors. About 20 of the visitors are adults while the rest are children. We typically need 4 – 6 volunteers for this service activity. Our House & the Genesis Shelter provides childcare and support for homeless families. We cook and serve brunch for about 40 visitors. About 20 of the visitors are adults while the rest are children. We typically need 4 – 6 volunteers for this service activity. We help MedShare (an organization that warehouses overstocked medicines and donated medical supplies) in sorting and packing of medical supplies provided to them by some businesses, hospitals or pharmacies. These sorted and packed medical supplies are shipped to regions in the world (e.g. third world countries) who gladly accept them. We normally need 4-6 adults and equal number of children for this service activity. Regular assembly of Atlanta Sai Center happens every Sunday from 3.00 PM onwards. For weekly devotional singing (Bhajans) and periodic special programs, proper arrangements need to be made by arranging chairs, cleaning the surroundings etc. We perform this activity every week at 2.30 PM. About 10 – 15 volunteers participate in this activity. This service is conducted by Center members living in North Atlanta. It involves preparing about 200 food bags and supplying them to Atlanta Mission Women’s shelter. Atlanta Task Force needs water bottles for its residents. We deliver about 200 – 300 bottles of water at their facility every week. At our Atlanta Sai Center members donate various packaged food items every Sunday. All such donated items are collected and given to a charity organization in Roswell, GA.
Women members of the Atlanta Sai Center knit scarves, hats and clothes needed for infants throughout the year. These items, knitted with love and care in every weave, are delivered to various shelters around metro Atlanta during winter time.